Then again, karma is a rather mischievous mistress. Heh. What do you do, Chris? I thought Biff was your job. Also biff ordered a Fent. Ordering more would make him own fents. I especially like how the title ties in to the comic. yay for people being unable to articulate or parse simple ideas. I think Biff got ripped off. 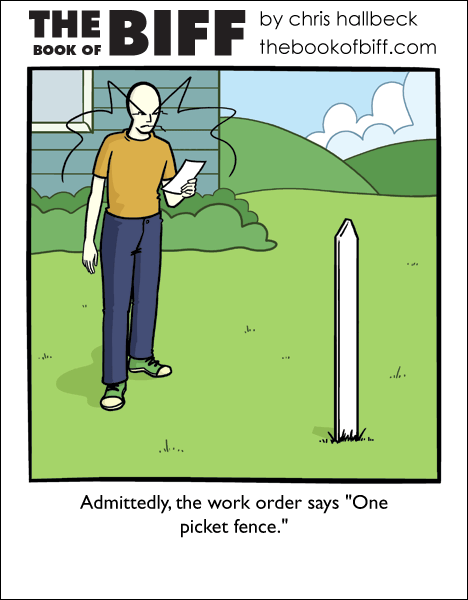 Now, if the work order had said “one-picket fence,” then that would have been a different matter (cf. http://partiallyclips.com/2005/09/22/witness-stand/). Ask for sense and someone gives you a penny. One picket does not a fence make. Biff should sue. Ha ha! Never though about it that way. I’m guessing “Thing you get that are not what you mean but they are what you said” week. As I working in construction, my first reaction is to shake my head in empathetic dismay. I’ve seen this principle put to practice LITERALLY… Today’s comic will go on the break room bulletin board. He could put a sign on it saying “Need more pickets”? Although, Biff has a case here. So it’s the contractors, not Biff who have messed up their English. Hasn’t anyone caught on yet. This week is “Literal Week”! YAY FOR DOING WHAT IT MEANS! The English is messed up. End road work. Drive through window. Dodge trucks.